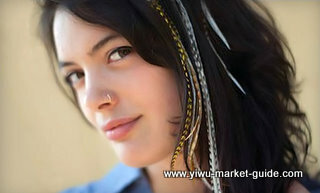 Feather hair extensions by Famous Feathers are the hottest hair trend for 2011. If you are a fashion fan who always keeps an eye on fashion trend, you will not be unfamiliar with the feather hair extension. They appear in a variety of fashion events and on TV shows like American Idol. If you are specialized in fashion accessories, you cannot miss this excellent business opportunity. So where can you purchase this fashion item? Yiwu market is your one of your destinations. These are quite new products. All together about 10-20 suppliers on the market are offering this. But only about 3 suppliers are scalable. At this time, suppliers are still very cautious about their samples. You will find the suppliers are not very cooperative even you pay 20USD buy a sample. The MOQ is usually 200doz for one design includes 6 colors. There are plenty of designs for you to choose from, also you can make your own design. If you want to print your logo on the card, the MOQ has to be 600doz. If your order large than 600doz, then you don’t need to pay the printing fee. The delivery time for the feather hair extension is about 20-25days. As they are becoming more and more popular, the supplier all has a tight schedule. There are plenty of designs and colors for you to choose. Furthermore, you can make your own style. The price for this designs are about $ 0.5, you can change the colour of the balls and feathers. 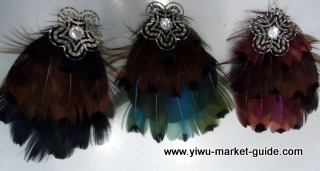 Not only the feather hair extension sell good this year, but also the feather hair clip. There is also a brooch on the back side, so you use it as a hair clip, also can use as a brooch. The price for this model is $ 0.5, usually there are 6 colors each design. 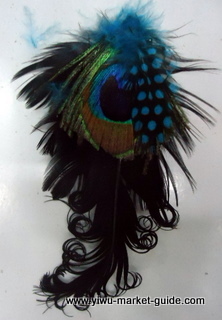 This one with peacock feather, the price is about $ 0.5. PS: Hair Feather extensions are an accessible, convenient, practical way to express your creativity and make you unforgettable! This fresh look is nothing shy of an epidemic that’s sweeping across the nation. Feather extensions blend into all varieties of hair no matter the shape, style, or texture. The variety of colors lets you control and let you build a look that accentuates your own uniqueness.